In general, dog obedience training will do the following and more for your German Shepherd if you follow through with it. • Deepen the bond between you and your dog. • Ensure your German Shepherd Dogs safety and happiness. • Help correct many types of dog nuisance behaviors such as jumping on people, digging, barking, and chewing. • Allow you to enjoy the fun and excitement of competing in dog obedience training trials and earning titles. Dog obedience competitions have been around since the early 1930's. The AKC version of the sport is now promoted and practiced by hundreds of dog obedience, kennel, and specialty clubs throughout the United States. It is an absorbing and involving sport and thousands of competitors all over the world enjoy participating with their canine partners. A few minutes of obedience training your German Shepherd every day, with plenty of praise and encouragement, will help your German Shepherd develop into a real obedience professional! The main objective of any dog training, especially dog obedience training and competitions, are to simply examine how well you and your German Shepherd work together as a team, by putting you through various kinds of exercises. A judge will deduct points every time you and your dog make a mistake during the exercise. Overall, the German Shepherd should work in a happy and natural manner. The lower level puppy and dog training obedience classes are usually very relaxed and informal. The hosting Kennel Club will set rules about how each exercise within each dog class should be conducted, so although the exercises may look straightforward at first glance, you and your GSD are actually expected to work to a high performance standard. Most dog obedience training and competitions begin with exercises that attest to the GSD's good manners such as walking on a leash at the owners side, standing to be touched by a stranger, sitting and lying down with distractions, and coming when called. More advanced dog obedience training classes prove the owners ability to train the German Shepherd to do a variety of "tricks" such as jumping different kinds of obstacles, fetching a dumbbell, obeying commands whether given by hand signal or voice, and finding items touched by the owner. The main goal in dog obedience training is to create a working team between human and GSD - both working in sync. 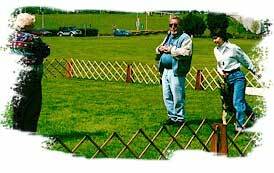 Above all, Dog Obedience Trials are considered to be "fun competitions" and are designed to be enjoyed by both dog and owner. Concerning AKC Dog Obedience Trials, to be eligible to compete a dog must be registered with the AKC or listed with the AKC Indefinite Listing Privilege (ILP) program, or be a Foundation Stock Service recorded breed that meets the eligibility requirements for competition and a minimum 6 months of age or older. • Puppy Class - A developmental dog obedience training course for the 3 to 5 month old GSD puppy which emphasizes socialization with people and other puppies. Also offered: information on growth, nutrition, grooming, housebreaking and problem-solving and basic household commands. • Basic Class - For German Shepherd dogs 5 to 6 months and older. This dog training is aimed at training you to train your dog. Emphasizes heel on a loose leash, sit, stand, down, stay in position, and come when called. Basic dog obedience training is important in keeping your dog safe. CGC is a certification program that is designed to reward German Shepherd Dogs that have good manners at home and in the community. GSD's that pass the CGC test receive a certificate from the AKC and are recorded in the AKC's Canine Good Citizen Archive. • All-breed Dog Obedience Trials, the most common types of dog obedience trials, offer competitions for more than 150 breeds and varieties of dogs recognized by the AKC. • Specialty Trials are restricted to dogs of a specific breed or to varieties of one breed. For example, the German Shepherd Dog Club of America Specialty is for German Shepherd Dogs only. or “rally-o”, is the latest American Kennel Club event to hit the dog show circuit. Rally has some characteristics of rally sports car racing, dog agility, and traditional dog obedience combined into a new fun sport. Much to the delight of many exhibitors, rally is now a regular class that can be included at dog obedience training and trials. As with other regular classes, German Shepherd Dog and handler teams can earn titles beginning with RN for novice level, RA for advanced, and RX for excellent level. • Heel on Leash and Figure Eight - show whether the GSD has learned to watch its handler and adjust its pace to stay with the handler. • Heel Free - done off leash. • Stand for Examination - is of great benefit when the German Shepherd needs hands-on care by a veterinarian. • Recall - provides the handler with the ability to call the dog and get an immediate response at all times. • Long Sit (1 minute) - allows the handler to have control of the dog when visitors come to the home. • Long Down (3 minutes) - the German Shepherd must remain in a down position. • Heel Free and Figure Eight - Same as Novice, but off leash. • Drop on Recall - can be a lifesaving command for a German Shepherd, since it gives the handler control in potentially dangerous situations. • Long Sit (3 minutes) - similar to the long sit in Novice, but the position must be held for a longer period of time with the handler out of the dog's sight. • Long Down (5 minutes) - German Shepherd must remain in a down position. • Signal Exercise - shows the German Shepherd Dog's ability to understand and correctly respond to the handler's signal to stand, stay, down, sit and come. No voice commands are given; only hand signals are allowed. • Scent Discrimination - shows the dog's ability to find the handler's scent among a pile of articles. • Directed Retrieve - proves the GSD's ability to follow a directional signal to retrieve a glove and promptly return it to the handler. • Moving Stand and Examination - the dog must heel, stand and stay as the handler moves away. The dog must stand and accept an examination by the judge and return to the handler on command. • Directed Jumping - the German Shepherd must go away from the handler, turn and sit. Then, the dog must clear whichever jump its handler indicates and promptly return to the handler. The Novice (CD) title must be completed before an exhibitor can enter the Open class. The Open title (CDX) must be earned before an exhibitor can enter the Utility class. • Companion Dog (CD) - The letters CD may be added after a German Shepherds registered name when it has been certified by three different judges as receiving qualifying scores in Novice classes at three licensed or member obedience trials. • Companion Dog Excellent (CDX) - The letters CDX may be added after a GSD's registered name after it has been certified by three different judges as receiving qualifying scores in Open classes at three licensed or member obedience trials. • Utility Dog (UD) - The letters UD may be added after a dog's registered name after it has been certified by three different judges as receiving qualifying scores in Utility classes at three licensed or member obedience trials. • Utility Dog Excellent (UDX) - German Shepherd Dogs with UD titles must earn qualifying scores in both Open B and Utility B at 10 trials in order to add the UDX title after their registered names. • Obedience Trial Champion (OTCH) - GSDs with UD titles must win 100 points and a first-place in Utility B and Open B, plus a third first-place win in either class, under three different judges. • National Obedience Champion (NOC) - The AKC awards this prestigious title annually to the dog that wins the AKC National Obedience Invitational. The letters NOC are placed before the dog's AKC-registered name and become part of the dog's permanent title. Dog obedience training and dog obedience competitions are an activity in which the German Shepherd excels. With its incredible intelligence, love of work and uncanny desire to make it's master happy, the German Shepherd is certainly one of the most prominent members of the dog obedience world and excel in all kinds of dog training.